French, Canadian and Italian nationals turned up at the screening of the award-winning wartime French movie ‘La Douleur’ or “The Pain” at the Pakistan national council of the arts (PNCA) Wednesday evening. The screening was jointly organized by the Alliance Francaise, Embassy of France and the PNCA. 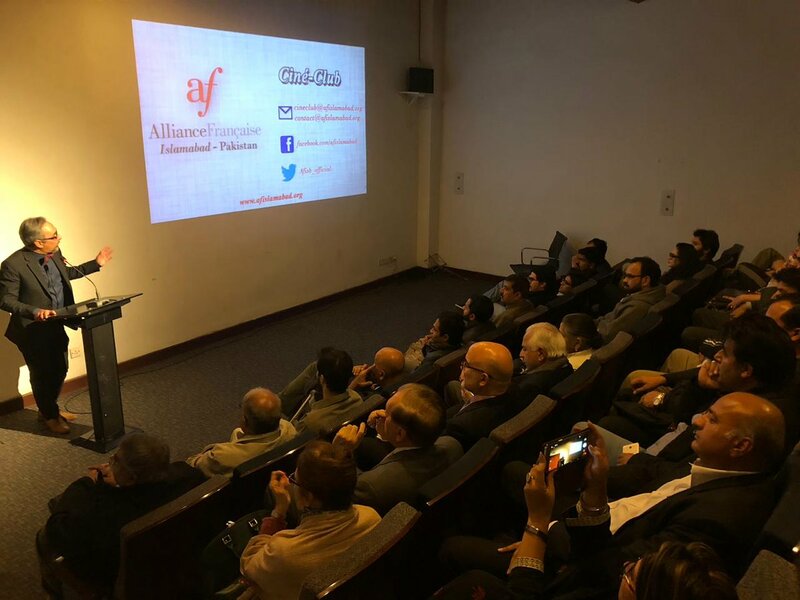 While giving a brief introduction of the movie Director of the Alliance, Ali Bhatti said ‘La Douleur’ was a 2017 production based on the diaries of Marguerite Duras about the World War II years from 1944 to 1946. Duras’ diaries were originally published in 1985 and the work is a collection of six texts recounting a mix of her experiences of the Nazi Occupation of France with fictional details. The movie has been acclaimed widely in France and bagged the prestigious Caesar Award and was also nominated by France in the foreign movie category for the Oscar. The two-hour plus movie is a semi-autobiographical work often cited as part of the Nouveau Roman movement which tried to redefine traditional ideas about set categories of books, fiction, non-fiction, biography, autobiography etc. “La Douleur” opens, briefly, in April, 1945, where a writer named Marguerite Duras (Mélanie Thierry) is desperately hoping for news about her husband, Robert Antelme (Emmanuel Bourdieu), an activist in the French Resistance who has been arrested. Then the action shifts back to June 1944 and Marguerite is seen seeking information about Robert and going to a German police office in Paris. There, she is received warmly by a French collaborationist official named Rabier (Benoît Magimel), who has literary aspirations of his own. The film takes the audience back and forth in the memory lane of Marguerite Duras and describes how painful it was to wait endlessly for her husband. The war is coming to an end now and the Germans are fleeing and the inmates of the concentration camps set up by Hitler and his forces all across the Europe are returning but Duras’ long wait does not come to end as doesn’t find Robert Antelme in any of the vehicles bringing back the prisoners from the camps. She makes great efforts to keep up appearances and tries to forget her husband assuming he has been shot by the occupying German forces but just before the end of the movie she is informed that Robert has been found alive in one of the camps but his condition is so worse that he cannot survive more than three days. The story takes yet another turn when in the end Robert is seen surviving but she moves away from him. The film left deep impact on the audience and according to one of the viewers the movie has re-lived the pains and anguish the World War II days when crimes against humanity were committed against the innocent men, women and children by Hitler.